The summer is the best time of year to date. When it’s beautiful out, there’s so much more to do with that special someone, and everyone’s sense of adventure comes to life. 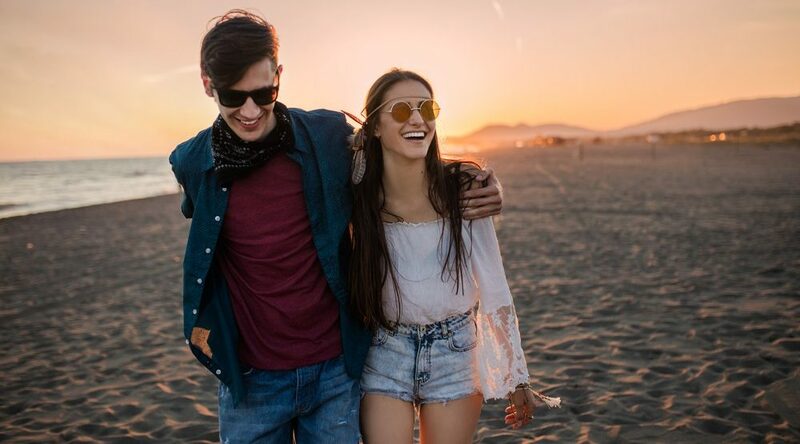 Fun date ideas are much easier to come up with in the summer months, typically much cheaper, and we also can’t justify the boring date-night-in when it’s gorgeous and hot out. The main reason why dating is so much better in the summer, though, is because we’re in a better mood. 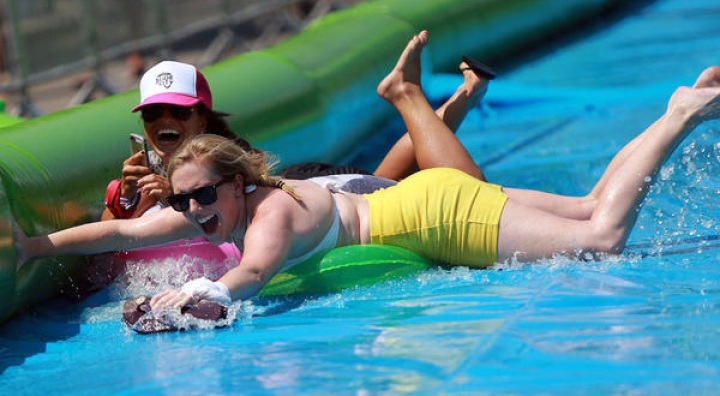 Vancouver’s longest (and most fun) water slide returns to North Vancouver on August 13 and 14. Don’t miss your chance to try out this 1,000 foot slip n’ slide down Lonsdale Avenue with your date. A very romantic date idea is to take that adorable Aquabus from Yaletown to Granville Island, and go for dinner at Bridges (it has a patio with a gorgeous water view) followed by some hilarious improv comedy at Vancouver Theatre Sports. 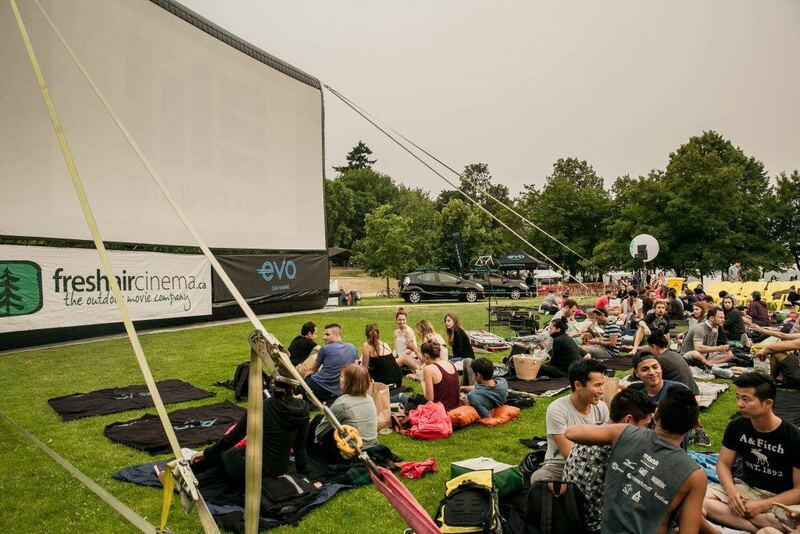 Every Tuesday until August 30, you can take your date to a free outdoor movie under the stars in Vancouver’s gorgeous Stanley Park. Pack a blanket, some snacks – maybe even a couple pillows and enjoy your outdoor movie date at Second Beach. Some upcoming showings you’ve got to look forward to include Purple Rain and Dirty Dancing. Alice Lake is not only one of the most beautiful nearby lakes we have, but it also is a location that rents out canoes, paddle boards and kayaks. A perfect summer date would be an hour of paddling around exploring the lake, followed by blowing up a floaty and floating together while taking in the gorgeous views of the clear waters and green forests. Every Friday until September 30, the Shipyard Plaza near charming Lonsdale Quay in North Vancouver is home to the Shipyards Night Market. This is a great summer date idea because there’s live music to enjoy, beautiful views of the water, delicious local food trucks to take your pick from for dinner and a beer garden offering up local craft beer. A Vancouver Food Tour is a great way to get outside, walk around, enjoy the city and try new foods. It’s sight-seeing combined with eating – a win-win date for the Vancouver-loving foodie. You can customize your tour to your preferences when it comes to which of Vancouver’s neighbourhoods you want to check out, what type of cuisine you want to try and whether you prefer wine or beer for pairings. Nat Bailey’s beautiful open-air setting makes for a casual and fun date. 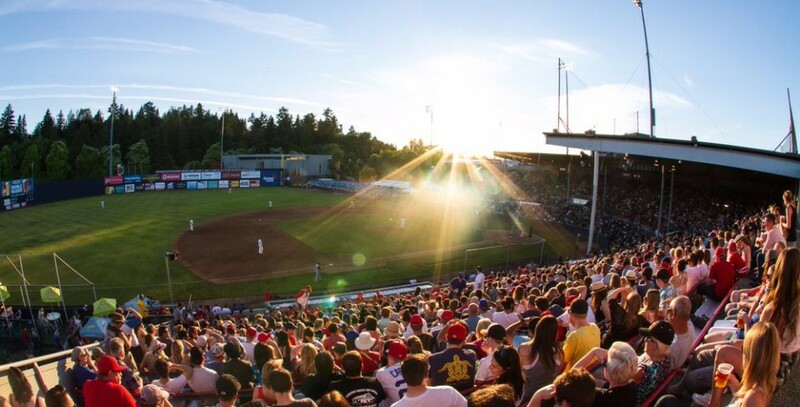 For as low as $14 per person, you can watch the Vancouver Canadians play ball, enjoy some cold brews, and get out in the sunshine while you root for your home team. Deep Cove is a gem within our city. It’s gorgeous, charismatic and the perfect place to rent a double-kayak with your date. Work up an appetite, because this charming area of North Vancouver has delicious restaurants with scenic ocean views. Who doesn’t love Italian food? The Italian Cultural Centre is hosting the Mercato Italian Market on August 19, allowing you to try many authentic tastes of Italy. The Italian Cultural Centre hosts fun date-night activities all the time, so if you miss this one, check out their website for more upcoming events. It’s too nice outside to be stuck inside a movie theatre, so why not surprise your date with tickets to see cultural outdoor theatre at Vancouver’s Bard on the Beach? This is a great opportunity to enjoy the nice weather while also getting your cultural fix. August’s shows include the classic Romeo and Juliet and Othello. On Wednesday, August 10, there is a special ‘Wine Wednesday’ pre-show event involving tips from experts. 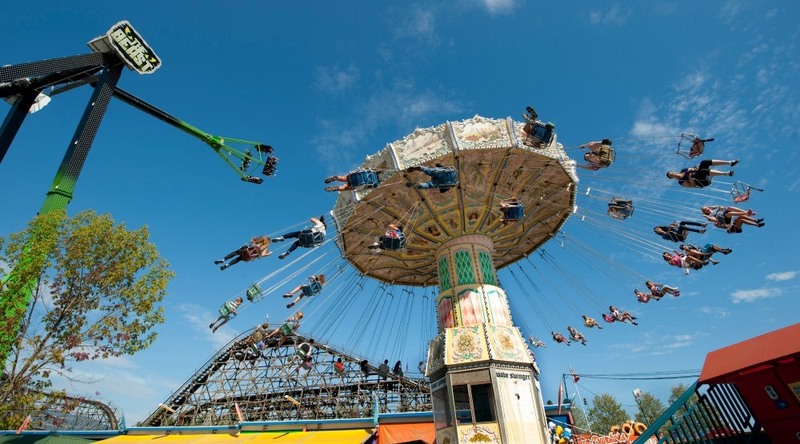 The Fair at the PNE has it all: rides, outdoor concerts, games, mini-golf, beer gardens and even a Craft Beer Fest. It’s guaranteed to be a full day of entertainment, and there are also lots of chances to get close and sneak in a kiss – especially on the Ferris Wheel. Kits Pool is a great spot for a date because you can spend the day relaxing, swimming, tanning, taking in the ocean views and you’re allowed to bring food but there’s also a convenient concession stand. The Greenheart TreeWalk involves scenic suspended walkways and tree platforms high above the forest ﬂoor for the ultimate nature experience. Located in the UBC Botanical Garden, this 310 metre-long tree top canopy walkway hangs from huge Douglas firs, cedars and grand firs, offering up a bird’s eye view of the incredible rainforest. This is one of the few opportunities to be up in the trees and surround yourself with the sounds and sights of the forest. Vancouver has so many gorgeous beaches, and a very simple yet extremely romantic date is a picnic at sunset at one of them. All you need is a blanket, a picnic, and a gorgeous view while you watch the sun go down. Make your trip to these places easy by taking Evo. Plus with their extended home zone you can now travel further. Sign up for free today and get 30 minutes of drive time. Evo is a proud sponsor of the Evo Summer Cinema Series and Slide the city. To see more of Erica's articles and to get free dating advice from experts across the globe, check out TheBabeReport.com and follow @the_babe_report on Instagram.